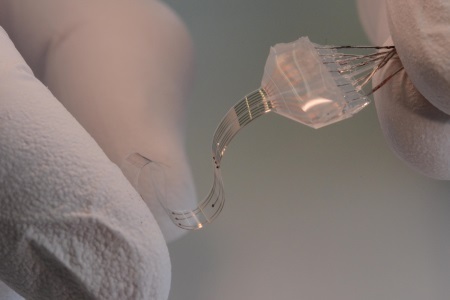 A recently developed neural implant may offer new therapies for paralyzed patients. The device is an electronic and chemical interface that has been designed for long-term close-contact with the spinal cord or brain. By matching certain properties of the brain, the implant could reduce inflammation and scar tissues that have been problematic in the past. In paralyzed patients, stimulating the spinal cord electrically and chemically is an approach that may allow function to be recovered. In the past, implants that have been used long-term have had several drawbacks that eventually caused them to fail. The devices must be placed underneath the nervous system’s protective tissue, which is called the dura mater. In many cases, the mobility of the spine causes stretching and rubbing of the tissues against implants, which are often rigid and unforgiving. These interactions cause friction, which causes inflammation and scar tissue accumulation, eventually leading to the failure of the implant. To overcome these problems, a new implant system has been designed by researchers at Switzerland’s École Polytechnique Fédérale de Lausanne (EPFL), according to a recent press release. The new device is designed to closely match the mechanical properties of the neural tissue it is interfacing with. In addition to electrical impulses, the implant also delivers chemical signals, or pharmacologic substances. Because of its elasticity, the e-Dura implant is able to deform in a way that is virtually identical to the tissue it is contacting, reducing the damage normal surface implants would produce. In addition to the elasticity and mechanical properties, the implants were designed with the shape of the dura mater, according to a recent study published by the EPFL team in Science. The device, in conjunction with embedded interconnects, electrodes, and chemotrodes, is capable of undergoing millions of cycles of mechanical stretch without negative effects. In addition to the successful longevity of the implant, it was able to deliver electrochemical spinal neuromodulation that restored locomotion in rats after a paralyzing injury. Testing in rats demonstrated that the implants were well tolerated for up to two months. Traditional implants would have caused significant damage to the neural tissue during this time due to their rigidity. The new neural implant can conduct electronic impulses despite its flexibility by using stretchable, cracked gold conducting paths. The actual electrodes themselves are made from platinum, while microfluidic channels allow passage of the pharmacologics that are required for the therapy. In this case, neurotransmitters are delivered to the damaged tissues in the spinal cord.